The main virtue of bent knives is the tremendous versatility they provide: a few knives can take the place of a chest full of gouges. This article discusses some of the reasons why bent knives are so versatile, and is written in the hope that readers who have not used them before will give them a serious look. I also compare bent knives with two of their tool relatives of completely different origin, but which also have curved blades - hooked knives and scorps. Bent Knives: These were invented hundreds of years ago by the First Nations - 'Native Indians' - of the Pacific coastline now spanned by Washington, British Columbia and Alaska. They are pointed double-edged knives with the bevels ground on one side of the blade only, and with the tip curved up in a parabolic shape. The parabola ranges from a shallow curve to a full J-shape, hence the blade has a curved and a flat region. The flat part is flush with the bottom of the handle. Most knives have the bevel on the inside, but 'reverse bevel' knives have it on the outside (see photo 2). Hooked Knives: The blade of these knives has the shape of a pirate's hook, hence there is no useable flat segment. Some of the range of knives called sloyd knives are hooked (see photo 3). Scorps: The blades of these are rings of steel with one sharpened edge, and tilted downwards at an angle of 45 degrees to the handle (see photo 4). 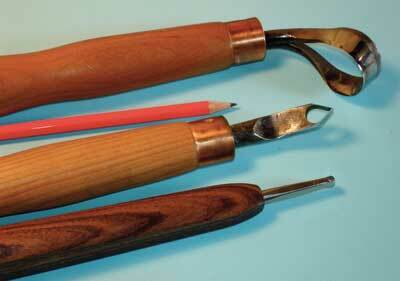 Some manufacturers use the term scorp for the two-handled chair-maker's tool that I would call an inshave. The knife is made by fitting the tang of the blade into a shallow slot carved into the handle, and whipping it in place with strong cord. Some commercial suppliers secure the blade with rivets. 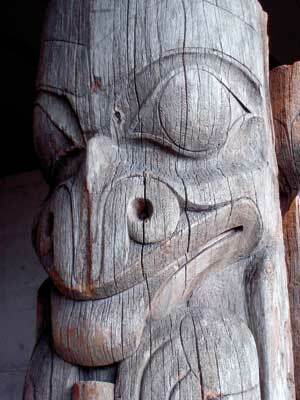 The traditional uses of bent knives were in making large ceremonial objects such as totem poles and masks (see photos 5-7), and functional objects such as bowls, spoons and canoe paddles. 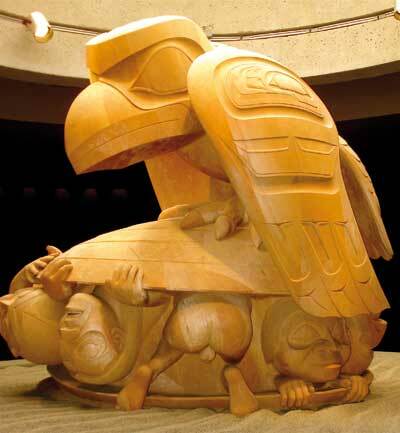 However nowadays, they are used not only for First Nation-style pieces but for all types of carving, both relief and in the round. 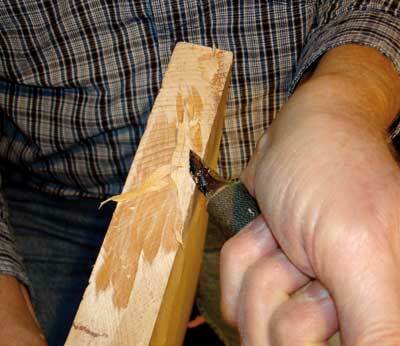 Push or pull: Most general work is done with the knife in one hand (see photos 8-9). Being double-edged means that it can be used on the push or pull stroke, hence the direction of the wood's grain can be accommodated without turning, very convenient when working on large pieces. Also the knife cuts well across the grain. Unique slicing action: The knife is generally held with the palm up, and the main cutting action is by rocking the wrist either away from or towards the body. The blade enters the wood at a relatively flat angle but the rocking of the wrist plus accompanying arm movement permits a slicing action that is remarkably powerful yet maintains tight control. This blade slices the wood much in the way one would sharpen a pencil. Slicing is generally useful, but particularly good for undercutting. Hollowing: To hollow, the curved end of the blade is used (see photo 10; compare with the sloyd knife in photo 11). Deeper hollows are made simply by using the part of the blade further along the parabola, or by switching to a more curved knife. Reverse bevel blades have a less aggressive attack, but the blade can be easily swivelled to change direction if required, allowing multi-plane concave cuts. 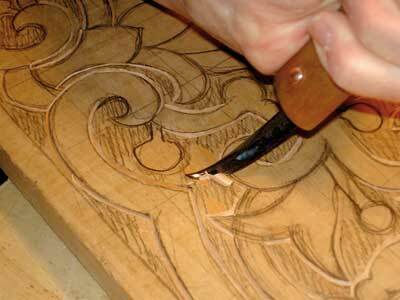 Scooping out waste in a detailed relief carving is shown in photo 12. Planing: The fact that the flat section of the knife is level with the bottom of the handle makes it ideal for planing flat surfaces or rounding off convex surfaces, hence, sanding is often unnecessary. Planing sometimes requires a palm-down grip to allow the full flat area of the blade to get close to the wood (see photo 13). 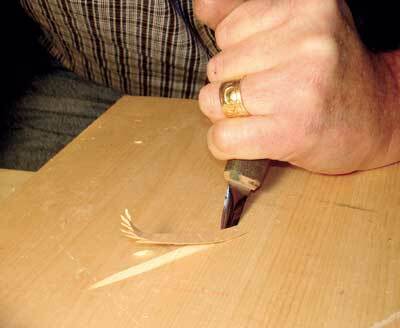 Planing is effective on end grain too (see photo 14). Two-handed power cuts: Larger knives with long handles permit a two-handed grip with the hand closer to the blade palm down, and the hand furthest away palm up (see photo 13). Here the main power comes from the big muscles of the upper arm, shoulders and back. Incising straight and curved lines: The great degree of control afforded by a bent knife makes it ideal for cutting straight or sinuous V-grooves in the wood (see photo 15). 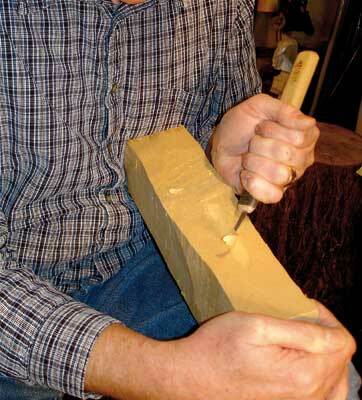 Roughing: The bigger two-handed knives are ideal for roughing out the shape of the piece, and wood can be removed very rapidly even in tight spots. 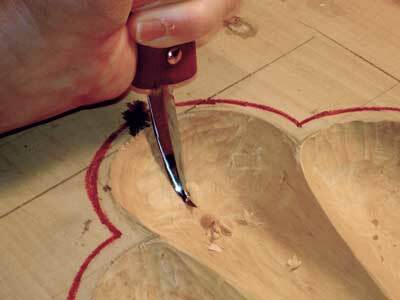 Detailing: The smaller knives are excellent for detailing, and even for chip carving. Cleaning out inside corners is a simple matter. Holding the work without a vise: Because much of the use of the knife is one-handed, the piece can be held in the other hand and braced against the body or other object, hence turning the piece is a simple matter. 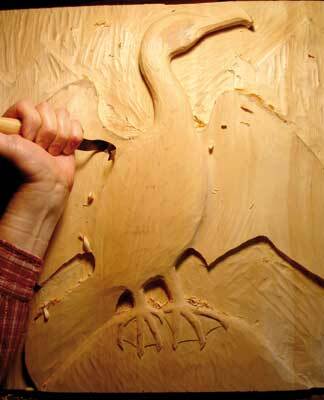 Carvings can be made essentially anywhere. 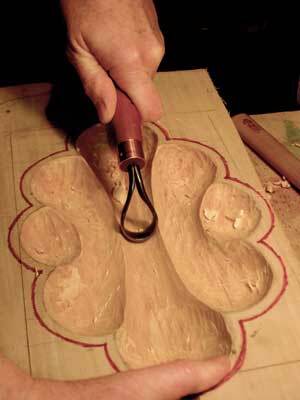 Usual safety precautions for knives should be applied, the most important of which is in one-handed carving to keep the free hand behind the cutting direction. 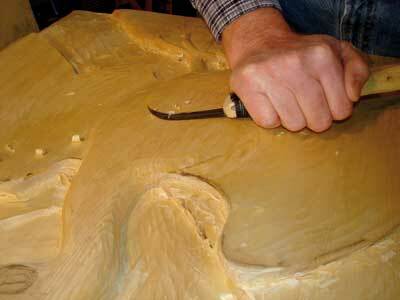 All carvers should wear safety gloves, preferably slash-proof. 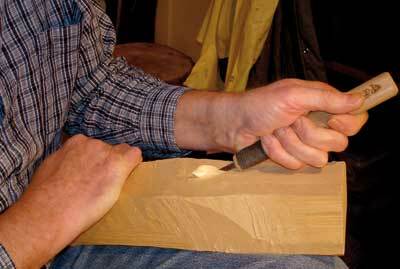 For thumb-braced one-handed carving, always wear a thumb guard or tape. For work braced against the chest, wear a leather apron. An unusual hazard is the upturned sharp point - use care reaching across knives on the bench. Both hooked knifes and scorps are limited largely to hollowing, whereas a single bent knife can do many tasks. Because of the blade's shape in a hooked knife, the torque of the cut tends to rotate the handle in the palm, making it mechanically less efficient. Scorping requires a pulling action that is unlike any other carving procedure and takes some getting used to. Scorps are mechanically very effective but not very versatile. How do bent knives compare with gouges? 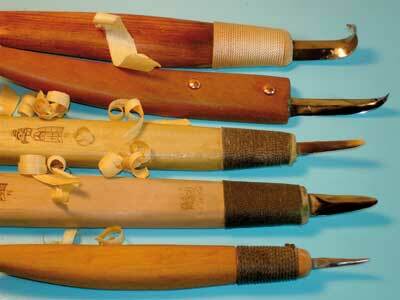 While individually less versatile, gouges are indispensable when great force is needed, such as with mallet work. Also, gouges can't be beaten for digging U-shaped channels. 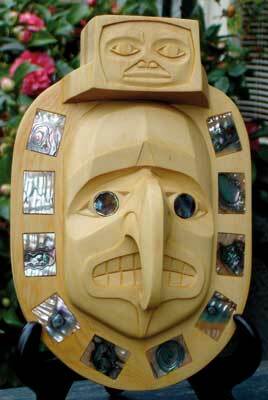 "The traditional uses of bent knives were in making large ceremonial objects such as totem poles and masks"